Study: Money Isn't Everything  But Status Is! People say money doesn't buy happiness. Except, according to a new study from Princeton University's Woodrow Wilson School, it sort of does  up to about $75,000 a year. The lower a person's annual income falls below that benchmark, the unhappier he or she feels. But no matter how much more than $75,000 people make, they don't report any greater degree of happiness. Before employers rush to hold  or raise  everyone's salary to $75,000, the study points out that there are actually two types of happiness. There's your changeable, day-to-day mood: whether you're stressed or blue or feeling emotionally sound. Then there's the deeper satisfaction you feel about the way your life is going  the kind of thing Tony Robbins tries to teach you. While having an income above the magic $75,000 cutoff doesn't seem to have an impact on the former (emotional well-being), it definitely improves people's Robbins-like life satisfaction. 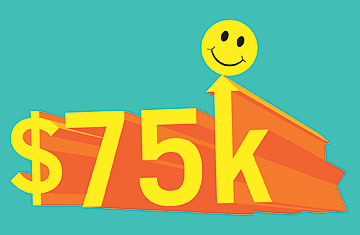 In other words, the more people make above $75,000, the more they feel their life is working out on the whole. But it doesn't make them any more jovial in the mornings. The study, by economist Angus Deaton and psychologist Daniel Kahneman, who has won a Nobel Prize for Economics, analyzed the responses of 450,000 Americans polled by Gallup and Healthways in 2008 and 2009. Participants were asked how they had felt the previous day and whether they were living the best possible life for them. They were also asked about their income. The authors found that most Americans  85%  regardless of their annual income, felt happy each day. Almost 40% of respondents also reported feeling stressed (which is not mutually exclusive with happiness) and 24% had feelings of sadness. Most people were also satisfied with the way their life was going. So, where does the $75,000 come into play? Researchers found that lower income did not cause sadness itself but made people feel more ground down by the problems they already had. The study found, for example, that among divorced people, about 51% who made less than $1,000 a month reported feeling sad or stressed the previous day, while only 24% of those earning more than $3,000 a month reported similar feelings. Among people with asthma, 41% of low earners reported feeling unhappy, compared with about 22% of the wealthier group. Having money clearly takes the sting out of adversities. But in the bigger view of their lives, people's evaluations were much more tied to their income. The more they made, the more they felt their life was going well. The survey asked respondents to place themselves on a life-satisfaction ladder, with the first rung meaning their lives were not going well and the 10th rung meaning it was as good as it could be. The higher their income, the higher the rung people chose. "Importantly, the same percentage increase in income has the same effect on evaluation for everyone, rich or poor alike, even though the absolute dollar amounts differ," the authors write. So every 10% rise in annual income moves people up the satisfaction ladder the same amount, whether they're making $25,000 or $100,000. "High incomes don't bring you happiness, but they do bring you a life you think is better," conclude the authors. Might it be time for Oprah to give these guys their own show? Past research on money and happiness has also found that it's not absolute wealth that's linked with happiness, but relative wealth or status  that is, how much more money you have than your neighbors. It's no surprise, then, that when the same polls are done in different countries, Americans come out as a bit of a mixed lot: they're fifth in terms of happiness, 33rd in terms of smiling and 10th in terms of enjoyment. At the same time, they're the 89th biggest worriers, the 69th saddest and fifth most stressed people out of the 151 nations studied. Even so, perhaps because of the country's general wealth, they are in the top 10 citizenries where people feel their lives are going well, beaten out by such eternal optimists as the Canadians, New Zealanders and Scandinavians. Right. Now that Princeton researchers have untangled that life mystery, maybe someone at MIT can look into the optimal amount of money required to buy us love.